Currently, the San Francisco Museum of Modern Art has an exhibition called Pop, Minimal, and Figurative Art, The Fisher Collection (May 14, 2016-ongoing). The entire exhibition is based around the art of famous Pop Artists, such as Roy Lichtenstein and Andy Warhol. I had the pleasure of viewing Roy Lichtenstein’s Figures with Sunset while visiting the SF MoMA. Figures with Sunset is a very large piece of art. It is 107 inches x 167 inches and takes up an entire wall in the exhibition hall. It was constructed in 1978 and is oil and Magna on canvas. This piece was part of a two decade study Lichtenstein did where he “reinterpreted great works of modern art in a Pop Art style” (Met Museum). Another example of a piece in this study is Stepping Out. The piece exhibits Lichtenstein’s typical style of using uniform dots to add color and dimension, but the figure in the piece is atypical. Lichtenstein is famous for his comic-esque work and more realistic human figures, but the man in this piece reminds me of Diego Rivera’s style. In Rivera’s work, his figures are realistic, but only to a certain extent. Rivera typically draws figures with very two-dimensional features, like Lichtenstein’s figure. On the other hand, this piece is more surrealist than typical Lichtenstein work or any Pop Art in that regard. Figures with Sunset gives a Pop Art meets Salvador Dali vibe. Like many of Dali’s pieces, this piece gives off a dreamlike vibe and the background incorporates many human features. 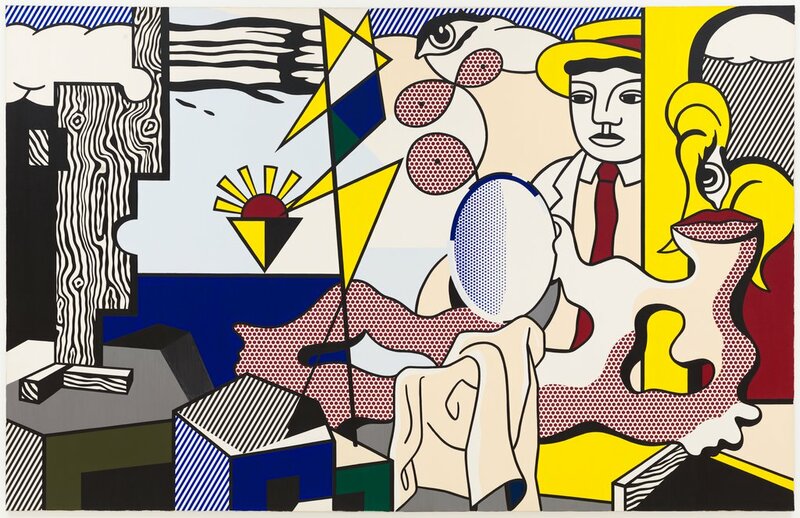 Although Figures with Sunset exhibits many different styles of artwork different from Lichtenstein’s typical style, he kept his classic dots in the forefront of his piece. Lichtenstein, Roy. Figures with Sunset. 1978. Fisher Collection, San Francisco Museum of Modern Art, San Francisco, CA. San Francisco Museum of Modern Art. Web. 28 Oct. 2016. “Roy Lichtenstein | Study for “Figures With Sunset” | The Met.” The Metropolitan Museum of Art, I.e. The Met Museum. N.p., n.d. Web. 28 Oct. 2016.